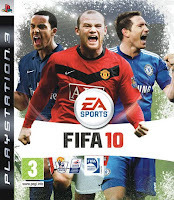 FIFA 10 is the best football game on any console since Sensible World of Soccer. A joy to play, I'm even alright at it. I won a Ledger playing FIFA so it's always gonna have a place in my heart. Pro Evo 2010 I haven't even bothered with, although AT still says it's a better single player game. But FIFA has the better multi-player experience which is ultimately crucial. Fluid passing, more responsive than FIFA 09 and the 360° movement makes it feel more natural than any footy title out there. The level of depth is there too, with so many different play modes including managerial and single player careers to play through. That early morning trip to ASDA with AT to pick it up for £25 was well worth it, although I kissed a fond farewell to it in order to trade in for COD. Sadly missed from the collection though, it'll get picked up again at some point on the cheap. An outstanding achievement from Naughty Dog that has helped to define gaming on a PS3 in 2009. Graphics to die for, a solid story and an absorbing cast this felt the closest to playing a movie that any game has got to yet. Yes it's on rails, but when the rails are this good it doesn't matter. Totally absorbing on all levels. There's been a lot of speculation about where gaming is heading, and in some ways Uncharted feels like a step backwards, an old school experience even. 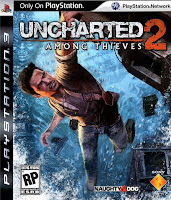 It's dressed up as an Indiana Jones style romp but the mix of old design and new tech has allowed Naughty Dog to produce a game that is the 'third person adventure' at it's peak. Where do I even start. What a game. Hard as hell to master but easy to pick up and play. The joy of running around a map with a shotgun in each hand has to be felt to be believed. Yes it's frustrating to lose out to a slightly imperfect internet connection now and again, but generally it feels like an even playing field. The ability of other players still beggars belief at times, they are scarily good. 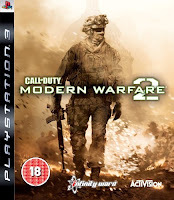 Single player has barely been touched by me, Infinity Ward are well aware that online is where there game will live and die and that's where they've focused their attention. However, there is a caveat. The single player game does contain one of the biggest miss steps in gaming history. Yep, even worse than my sprained ankle on Saturday night. The terrorist attack, which you take part in, is about as bad taste as you can get, it just feels wrong and I nearly shifted the game down a place for it. Maybe I should have, but online, this is gaming perfection. That can't really be denied. Yes it's essentially running around shooting the crap out of one another but frankly it's never been done this well. If you don't own a console and have never seen this game up and running you'd be staggered by it. Buy a PS3 for it. Not an XBox, cause you won't be able to play me. If you do own a PS3 add me online (Gray333) and see if you can cope with Akimbo.